CCC Team will start with six riders instead of seven at the Cadel Evans Great Ocean Road Race. Patrick Bevin couldn't recover on time to appear at the WorldTour race. Bevin crashed at the penultimate stage of the Tour Down Under while he was wearing the leader's jersey and even though he didn't suffer any fractures, he hasn't recovered from the contusions and bruises he suffered on time for the race. "We have made the decision to leave Patrick Bevin at home in order to recover properly from his injuries after crashing badly at the Santos Tour Down Under last week," said Sports Director Jackson Stewart. "This close to the race, we are unable to bring another rider in from Europe so we will line up with six riders on Sunday. Although we are a man down, we have six motivated and strong riders ready to race, all of whom showed great form in Adelaide." 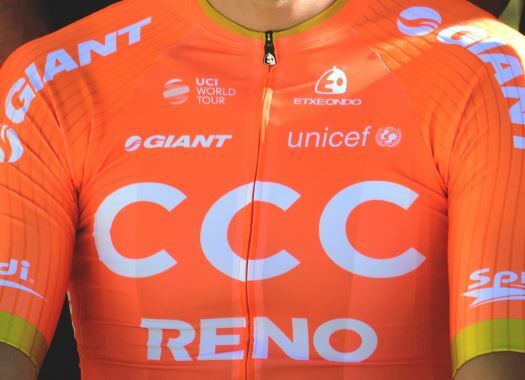 But CCC has several options for the Australian one-day race. "The Cadel Evans Great Ocean Road Race presents a tough course but it usually comes down to a reduced sprint," Stewart explained. "We have Jakub Mareczko and Szymon Sajnok for this scenario, two fast riders who can certainly be up there if they are on the right side of the move in the finale, as well as Víctor de la Parte, ?ukasz Owsian, Joey Rosskopf, and Francisco Ventoso, who are all quite suited to the rolling terrain and can try for a breakaway or solid attack in the finale. We will look to race aggressively and make the most of our last race in Australia."